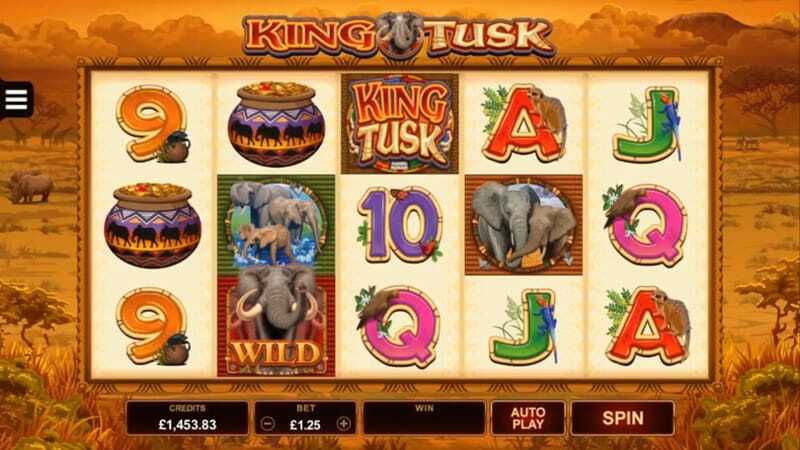 King Tusk is a Safari themed slots game with an emphasis on Elephants. Software developer Microgaming has done justice to this game with its great audiovisuals. The online casino slots game has generously provided 3 different Free Spins Features: Elephants Gone Wild, Elephants Stampede, and Elephant Dance. King Tusk has 5 reels and 25 pay lines, and it is ready for a spin on all devices. With a wide betting range (minimum bet of £0.25, maximum bet of £62.50) and its several Bonus Features, the opportunities for big wins are elephantine in this one! If you love promo's, get the best win slot bonuses today. King Tusk is set on sun-baked African savannah littered with scarce trees and beautiful animals in the distance. The backdrop frames the game board beautifully with its orange flame hue and subtle details. The lower value symbols on the reels are the card symbols (9 to Ace) but they have been customized with little animals creeping up behind the symbols to convey the feel of a safari. The higher value symbols include gold and elephants. The online slots game does feel like an African Safari Adventure with its display and elephants’ trumpeting to announce your entry to the several Bonus Features. This is depicted by the game’s logo itself with ‘WILD’ written across is. As all Wilds go, this can substitute almost every symbol to form a winning combination. The only exception to the rule is the Scatter Symbol (King Tusk ) which cannot be replaced. The symbol with ‘KING TUSK’ written across is represents the Scatter. When 3 or more appear on the screen, it triggers the Free Spins Round. 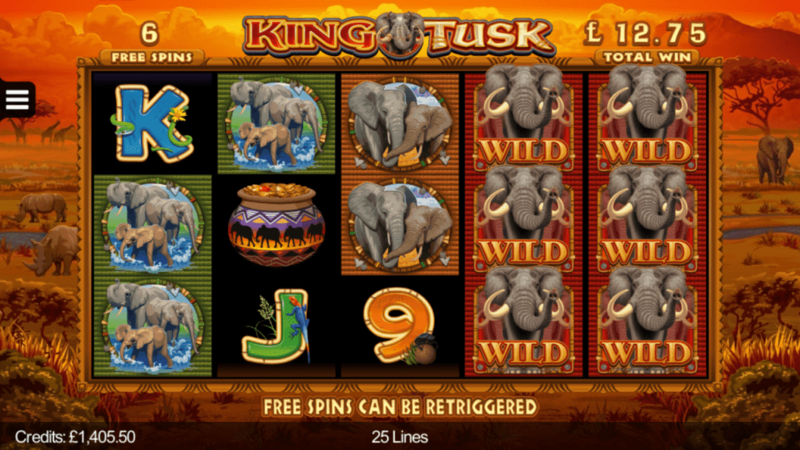 In King Tusk it is all about the Free Spins as they slots game provides players with 3 different Free Spin options. Upon spotting 3 Scatters in the base game, the Free Spins Round is unlocked. Here, you will get 10 Free Spins (with a possibility to retrigger) and options of which Bonus Feature you would like to pair the Free Spins with. If you select this feature, all the high paying symbols convert to Wild. This is one place where you welcome a stampede! In this bonus feature, you will receive 2 entire reels that are Wilds. This feature functions as an escalating Wild. You will receive 1 new Wild with each spin that will remain locked in place for the next 5 spins. King Tusk is an exciting slots game, especially for animal-loving folk. The elephants are bigger than life and give a lot. The 3 Bonus Features for the Free Spin Rounds keeps your eyes glued to this colossal slots game and its really good fun.